Aim: The aim of this study was to describe the characteristics of the mandibular third molar at highest risk for acute pericoronitis using clinical and radiographic analysis. Materials and Methods: A total of 120 patients ranging in age from 18 to 55 years suffering from pericoronitis were examined. Subjective and objective observations were recorded that included the age, gender, angulation of partially impacted mandibular third molar, the frequency of pericoronitis in a year, the presence of impinging maxillary third molar, the extent of soft tissue coverage over the impacted mandibular third molar, the clinical signs evaluated in the patient, the class and position of the impacted mandibular third molar, and the presence of distal radiolucency with respect to the impacted mandibular third molar. Results: The results obtained in the study indicate that pericoronitis is associated more in the age group of 26–35 years and is more commonly reported in the female gender. Distoangular partially impacted mandibular third molars impacted at Class II and position B seem to be at the highest risk of developing pericoronitis. Conclusion: The results obtained in the study indicate that pericoronitis is associated more in the age group of 26-35 years and is more commonly reported in the female gender.Distoangular partially impacted mandibular third molars impacted at class II and position B seem to be at the highest risk of developing pericoronitis. Pericoronitis is a painful, debilitating infection that is most commonly found among young adults with erupting mandibular third molars and accounts for approximately 10% of the third molars extracted. The associated spectrum of symptoms can range from mild, low-grade pain to sharp or throbbing pain, redness, swelling, purulence, limited mouth opening, fever, lymphadenopathy, halitosis, pharyngeal involvement, and systemic toxemia. The development and eruption patterns of third molars have an impact on the dental arch. However, there seems to be no universally acceptable predictive criteria to assess the relationship of pericoronitis and the pattern of third molar eruption/impaction. To determine predictive criteria for acute pericoronitis, it is necessary to first describe which third molar is most likely to become infected. Analysis of eruption patterns of the impacted mandibular molars may lead to early prediction and diagnosis of the various pathologies associated with the impacted mandibular molar. The purpose of this study was to describe the characteristics of the mandibular third molar at highest risk for acute pericoronitis, using clinical and radiographic analysis. The samples for this study were selected from the outpatient Department of Oral and Maxillofacial Surgery, Army College of Dental Sciences, Secunderabad. The study period was from February 2015 to August 2016. A total of 120 patients (79 females and 41 males) were included in the study, in whom 204 partially impacted mandibular molars were evaluated. Ethical clearance was obtained to carry out the study. The mean age of the patients was 36.5 years (range 18–55 years). All the patients were examined with a mouth mirror and a no. 3 explorer. The history of symptoms of the affected mandibular third molar was recorded and a thorough clinical examination was carried out during the acute phase of pericoronitis. Standardized panoramic radiographs were taken for radiographic analysis. The impacted third molars were also classified on the basis of Pell and Gregory classification, which depicts the relation of the mandibular third molar to the anterior border of ramus and the depth of the mandibular third molar with relation to the second molar. The presence of distal radiolucency with respect to the impacted mandibular third molar. 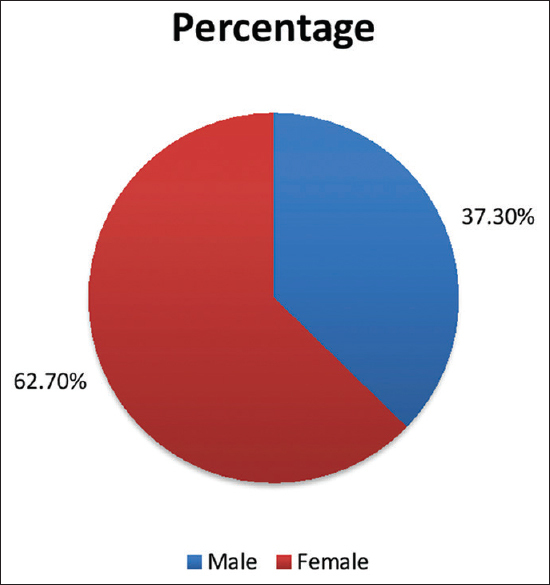 The data were analyzed with the use of the computer program, SPSS 18.0 for windows (Illinois, USA). Results obtained in the study were subjected to statistical analysis by Pearson Chi-square test, ANOVA with post hoc Games-Howell test, independent sample t-test, and ANOVA with post hoc Tukey's test. The level of significance was set at P < 0.005. Pericoronitis with respect to impacted mandibular third molar was observed to be associated maximum with the age group between 26 and 35 years with a percentage of 64.2%, followed by the age group 18–25 years [Figure 1]. 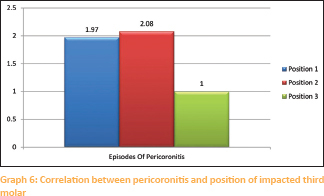 Female patients (62.7%) were found to be more affected with pericoronitis than male patients (37.3%) [Figure 2]. Out of the 204 impacted mandibular third molars examined with pericoronitis, maximum incidence of pericoronitis was observed with distoangular impactions, accounting for 49.5% while horizontal impactions were observed to be least associated with pericoronitis (distoangular > vertical > mesioangular > horizontal). 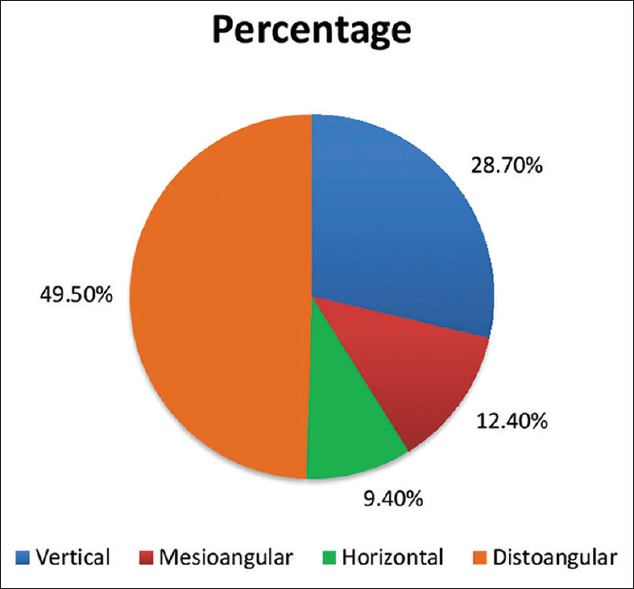 Difference between the types of angulations was statistically significant for all age groups (P < 0.001), evaluated using ANOVA with post hoc Games-Howell test [Figure 3]. Distoangular impactions were associated with the maximum episodes of pericoronitis; difference between the types of angulations was statistically significant for all age groups (P < 0.001), evaluated using ANOVA with post hoc Games-Howell test [Graph 1]. The effect of presence of impinging maxillary third molar on pericoronitis was evaluated using the independent sample t-test. Results were found to be insignificant for the same (P = 0.182) [Graph 2]. An independent sample t-test was used to evaluate the number of episodes of pericoronitis. 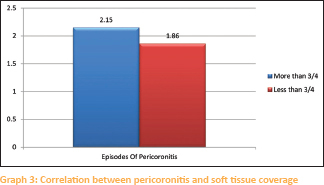 The frequency of pericoronitis was seen to be more in patients with more than third-fourth soft tissue coverage when compared to patients with less than third-fourth soft tissue coverage, calculated using independent sample t-test (P = 0.019) [Graph 3]. The patients were evaluated clinically for fever, swelling, trismus, difficulty in swallowing, and enlarged lymph nodes. The incidence of clinical signs was seen to be maximum in patients with distoangular impactions followed by vertical impactions and was found to be the least with horizontal impactions. The results were significant for swelling (P < 0.001), trismus (P - 0.001), and enlarged lymph nodes (P = 0.007). They were found to be insignificant for fever and difficulty in swallowing [Graph 4]. ANOVA post hoc Tukey's test was used to evaluate the incidence of pericoronitis with respect to the class and position of the impacted third molars classified on the basis of Pell and Gregory classification. Pericoronitis was found to be associated maximum with Class II mandibular third molar impactions, followed by Class I impactions (P < 0.001) [Graph 5]. 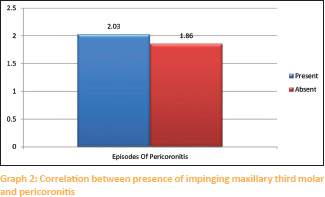 Mandibular third molars impacted at position B had the maximum incidence of pericoronitis followed by position A (P = 0.032) [Graph 5] and [Graph 6]. 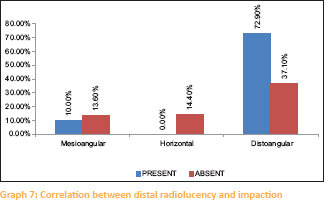 Distal radiolucency was found to be associated the most with distoangular impactions (72.9%) followed by vertical impactions (17.1%) [Graph 7]. Mandibular third molars are the most commonly impacted teeth with the incidence of impaction varying considerably among different populations, ranging from 9.5% to 39%. The term pericoronitis is derived from the prefix peri-around, and corona-crown and is the infection around the crown of a tooth and can lead to various pathological conditions including mild discomfort, acute illness with severe pain, dysfunction, systemic upset, and serious complications. On the other hand, the results of this study differ from the findings of Kay and Lee and Kim who found both the sexes to be equally affected by pericoronitis. The higher frequency of impacted third molars in females could be as a consequence of their jaws that stop growing when the third molars just begin to erupt, in contrary to males in whom the growth of the jaws continues beyond the time of eruption of third molars.,, Kay reported that an etiological connection seems probable between pregnancy and the subsequent development or recurrence of pericoronitis, particularly in the second trimester. In the study conducted by him, 105 pregnant patients from the total of 117 experienced their attack of pericoronal infection during the second trimester. 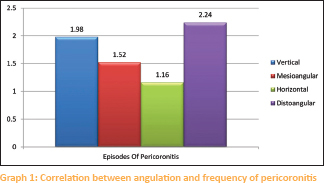 In the present study, distoangular impactions (49.5%) were observed to be associated more with pericoronitis when compared to other angulations. Probably, some distoangular wisdom teeth which have penetrated bone may meet an additional deterrent to eruptive progress in the form of a thick retromolar pad instead of the morphological gingival tissue which is encountered at the final stage of the path to normal eruption., It is speculated that pressure from the impacted tooth upon the undersurface of this resistant soft tissue structure during phases of eruptive stimulus acts as an irritant and may induce a mild inflammatory reaction within the retromolar tissues. These findings do not coincide with the observations of Yamalik and Bozkaya and Hazza'a et al. who reported that the maximum cases of pericoronitis were associated with vertical impactions (51%). This could be due to the reason that some distoangular impactions showed borderline values for the classification and some investigators might classify them as vertical impactions., The correlation between the angular position of the mandibular third molar and pericoronitis may be explained by the fact that some angular positions of mandibular third molars are more frequent than the others. Difference in genetic background, racial difference, and different socioeconomic status could be responsible for this variation. It is noted that unless treatment is decisive, pericoronitis tends to linger and smolder as a chronic condition, punctuated by acute or subacute flareups., It was noted by Kay that nearly one-half of the total patients evaluated had two or more preceding incidents of pericoronitis. In the present study, the maximum frequency of pericoronitis was observed with distoangular impactions, closely followed by vertical impactions and was seen the least in horizontal impactions. In this study, there was no significant association between the impingement of the maxillary third molar and development of pericoronitis with respect to the partially erupted mandibular third molar. In a study conducted by Kay, cuspal impingement upon the gum flap by an opposing maxillary molar, and the traumatic effect appeared to act as an aggravant although an attack of pericoronitis can occur even in the absence of a traumatizing antagonist. He observed from patients' descriptions and personal observation that in the majority of cases, swelling of the gum flap appears first, probably as an inflammatory response to bacterial infection. As the edematous soft tissue hood comes into occlusion with the opposing tooth, it becomes crushed and bruised, and the inflammatory reaction is intensified. The present study showed that the mandibular third molars partially covered by soft tissue were seen to be more affected with pericoronitis when compared to mandibular third molars which were completely covered or fully erupted. These observations are consistent with the findings of Punwutikorn et al., who also demonstrated the same results. Knutsson et al. reported an odds ratio (risk) 22–34 times higher for partially impacted molars than for molars completely covered by soft tissue or bone. In the present study, no case of pericoronitis has been reported in fully bony impacted mandibular third molars. A possible explanation for these findings may be related to the initiation of inflammation in the potential space between the crown of the tooth and the overlying soft tissue. In the partially erupted teeth, the space is more likely to trap food debris leading to stagnation, bacterial colonization, and subsequent inflammation. Another reason cited for this observation could be the exposure of these teeth to the oral environment in which they are subjected to chemical and mechanical irritation that might lead to the destruction of teeth and supporting structures leading to inflammation and subsequent pericoronitis. The various signs and symptoms related to pericoronitis taken into consideration in this study were fever, swelling, trismus, difficulty in swallowing, and enlarged lymph nodes. The results were significant for swelling, trismus, and enlarged lymph nodes and were found to be insignificant for fever and difficulty in swallowing. According to a study conducted by Jirapun and Aurasa, the symptoms associated with pericoronitis were categorized as pain, 35.3%; swelling, 21.7%; discomfort from food impaction, 3.6%; pus discharge, 3.0%; and other symptoms, 1.3% (such as trismus, sore throat, and lymphadenitis). In the present study, maximum incidence of pericoronitis was associated with the mandibular third molars impacted at position B followed by position A. These results are in agreement with the study conducted by Blondeau and Daniel, and Almendros-Marqués et al. from Spain who reported position B as the most common position of mandibular third molars associated with pericoronitis. They quoted these variations in angulation and level of impaction could be due to the difference in race, patient selection criteria, and study population. These results were conflicting with the results of Hazza'a et al. who stated that the mandibular third molars at position A were the most commonly affected by pericoronitis (80.2%), followed by those in position B (19.8%). He stated that the possible explanation for this could be that most partially erupted teeth included in the study (67%) were found to be at or above the level of occlusal plane rendering them more vulnerable to pericoronitis in the adjacent tissues. More incidence of pericoronitis at position B and A could be due to the reason that these positions are more prone to trauma from the opposite teeth when compared to teeth in other inferior positions. Thus, it can be concluded that pericoronitis cases are most likely to occur when a mandibular third molar is at or near to the same level of the occlusal plane of the arch. Enlarged follicle around impacted mandibular third molars was studied by Emad Eddin Yacob Juma Qirreish. 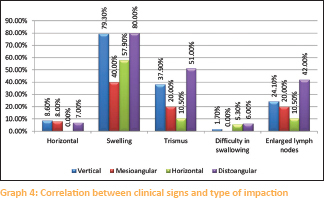 He found that vertically impacted third molars had the highest propensity for cystic changes (68.5%), followed by mesially inclined impactions (25.9%), and distally angulated impactions (5%). This is in contrast to the results found in the present study in which distal radiolucency was associated the maximum with distoangular impactions, followed by vertical impactions and was not seen to be associated with horizontal impactions. These findings differ from that of Knutsson et al. where the mesioangular impacted molars predominated in developing cysts. The enlarged follicular space can be explained on the basis of a study conducted by Kay who demonstrated that during its development, the tooth germ is enclosed by a rim of follicle and this, in turn, is surrounded by an outer margin of condensed bone. A semilunar radiolucent gutter occupied by follicular tissue persists on the distal aspect of the third molar, and typically, this is bounded by an intact, white limiting line. Frequent repeated exacerbations of pericoronal disease or an unremitting chronic pericoronitis will cause a discontinuity in the cortical rim of the follicular space, and partial loss is followed eventually by the disappearance of the remainder of the definitive margin. This leads to irregular destruction of the peripheral cancellous bone later, and the thin crescentic radiolucent band enlarges to such an extent that the defect becomes crateriform in shape and presents itself as a distal radiolucency. There are certain limitations inherent in the present study. The sample size of the study is small, more number of patients could have been included in the study. Furthermore, other variables such as distal caries with respect to mandibular second molar, seasonal variations, periodontal problems, and cystic changes could have been included in the study. Hence, the present study opens vistas for further research. The results obtained in the study indicate that pericoronitis is associated more in the age group of 26–35 years and is more commonly reported in the female gender. Distoangular partially impacted mandibular third molars impacted at Class II and position B seem to be at the highest risk of developing pericoronitis. Leone SA, Edenfield MJ, Cohen ME. Correlation of acute pericoronitis and the position of the mandibular third molar. Oral Surg Oral Med Oral Pathol 1986;62:245-50. Yamalik K, Bozkaya S. The predictivity of mandibular third molar position as a risk indicator for pericoronitis. Clin Oral Investig 2008;12:9-14. Hattab FN. Positional changes and eruption of impacted mandibular third molars in young adults. A radiographic 4-year follow-up study. Oral Surg Oral Med Oral Pathol Oral Radiol Endod 1997;84:604-8. Kurchid KN, Shihab OI. Pattern of mandibular third molar impaction in patients attended the Hawler College of Dentistry: A retrospective radiographic study. Zanco J Med Sci 2010;14:1-4. Hazza'a AM, Bataineh AB, Odat AA. Angulation of mandibular third molars as a predictive factor for pericoronitis. J Contemp Dent Pract 2009;10:51-8. Knutsson K, Brehmer B, Lysell L, Rohlin M. Pathoses associated with mandibular third molars subjected to removal. Oral Surg Oral Med Oral Pathol Oral Radiol Endod 1996;82:10-7. Nitzan DW, Tal O, Sela MN, Shteyer A. Pericoronitis: A reappraisal of its clinical and microbiologic aspects. J Oral Maxillofac Surg 1985;43:510-6. Lysell L, Rohlin M. A study of indications used for removal of the mandibular third molar. Int J Oral Maxillofac Surg 1988;17:161-4. Sasano T, Kuribara N, Iikubo M, Yoshida A, Satoh-Kuiriwada S, Shoji N, et al. Influence of angular position and degree of impaction of third molars on development of symptoms: Long-term follow-up under good oral hygiene conditions. Tohoku J Exp Med 2003;200:75-83. Kay LW. Investigations into the nature of pericoronitis. Br J Oral Surg 1966;3:188-205. Halverson BA, Anderson WH 3rd. The mandibular third molar position as a predictive criteria for risk for pericoronitis: A retrospective study. Mil Med 1992;157:142-5. Lee DK, Kim BJ. The relation of pericoronitis to the position of the mandibular third molar. Taehan Chikkwa Uisa Hyophoe Chi 1989;27:201-9. Hassan AH. Pattern of third molar impaction in a Saudi population. Clin Cosmet Investig Dent 2010;2:109-13. Hugoson A, Kugelberg CF. 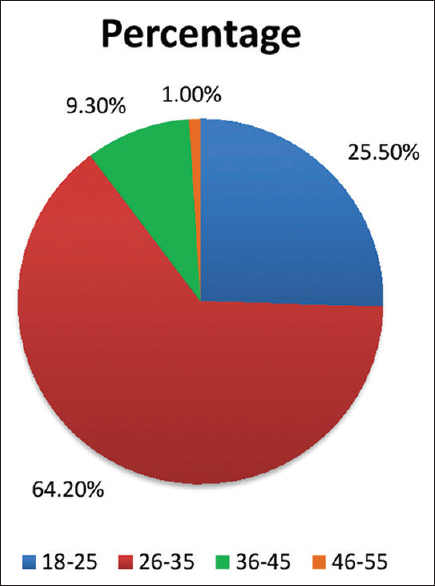 The prevalence of third molars in a Swedish population. An epidemiological study. Community Dent Health 1988;5:121-38. Quek SL, Tay CK, Tay KH, Toh SL, Lim KC. Pattern of third molar impaction in a Singapore Chinese population: A retrospective radiographic survey. Int J Oral Maxillofac Surg 2003;32:548-52. Blondeau F, Daniel NG. Extraction of impacted mandibular third molars: Postoperative complications and their risk factors. J Can Dent Assoc 2007;73:325. Main DM. Follicular cysts of mandibular third molar teeth: Radiological evaluation of enlargement. Dentomaxillofac Radiol 1989;18:156-9. Punwutikorn J, Waikakul A, Ochareon P. Symptoms of unerupted mandibular third molars. Oral Surg Oral Med Oral Pathol Oral Radiol Endod 1999;87:305-10. AL-Hamdani SA, Al-Sened MM, Hussein KT, Al-Naaimi AS. 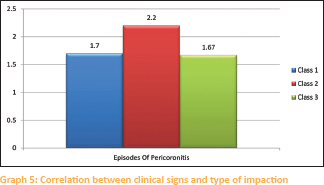 Factors associated with pericoronitis among subjects with impacted third molars teeth. MDJ 2011;8:193-201. Almendros-Marqués N, Berini-Aytés L, Gay-Escoda C. Influence of lower third molar position on the incidence of preoperative complications. Oral Surg Oral Med Oral Pathol Oral Radiol Endod 2006;102:725-32. Sandhu S, Kaur T. Radiographic evaluation of the status of third molars in the Asian-Indian students. J Oral Maxillofac Surg 2005;63:640-5. Richardson ME. Lower third molar space. Angle Orthod 1987;57:155-61. Murad N, Khan Y, Qaiyum FA. Predesposing factors for the infection of mandibular third molar. Pak Oral Dent J 2013;33:253-6.